Peninsula Free Health Services (PFHS) provides essential healthcare services to the uninsured. Located at 26 Hinckley Ridge Rd., Blue Hill, ME, adjacent to the Union 93 school superintendent’s office, PFHS is currently opened the second Monday of each month from 3-6 p.m. including this Monday, Columbus Day, October 8th. For More Information: please call 266-5009 at any time or 374-5585 during open hours for appointments although appointments are not required. We hope to return to our every Monday schedule as soon as we acquire more doctors willing to join our all volunteer staff. 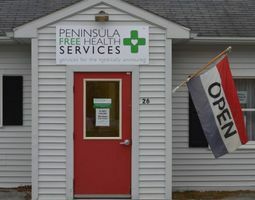 You may also find us on Facebook at Peninsulafreehealth where you can find open days, more information and make appointments.